When the stock market is going up, investors love it. When it’s going down, not so much. If you’re one of those folks who thinks saving for retirement shouldn’t have to be so unpredictable, read on! There is a safe and proven alternative to Wall Street. It offers guaranteed growth, a predictable income stream, tax advantages, and very little in the way of government interference. Millions have found their investment alternative of choice in high cash value dividend-paying whole life insurance. Huh? Life Insurance as an Investment Alternative to Wall Street? Absolutely. For well over 100 years, families have used life insurance – the right kind of life insurance – to grow wealth, protect it from creditors, and pass it to their heirs, income tax-free. Among those whose lives and businesses have been changed by their use of whole life insurance as an investment alternative are Walt Disney, J.C. Penny, and many others. Don’t get the policy unless it’s a non-direct recognition policy. Without bogging you down in technical details, this means that when you access your money by “borrowing from yourself,” you can be assured your money will continue to grow, just as if you hadn’t touched it. Only a handful of life insurance companies offer policies that meet all these requirements. And relatively few life insurance advisors offer or even know about these policies, for two reasons. First, the insurance advisor who helps you buy a Bank On Yourself-type policy must be willing to accept 50-70% less commission than if you purchase a traditional whole life insurance policy. That’s because a big chunk of your premium goes into two riders that turbocharge the growth of your cash value, but only pay the agent a very small commission. Second, because relatively few companies offer this type of policy, it’s not even covered in the traditional licensing, training, certification, and continuing education programs agents take. The kind of policy we just described is sometimes referred to as a high cash value dividend-paying whole life insurance policy. Around here, we refer to them as Bank On Yourself-type life insurance policies. These policies have more guarantees than we can describe here. Here’s an article about dividend-paying whole life insurance that has all the details. Now that we’re on the same page regarding the type of life insurance policy we’re talking about, let’s compare high cash value dividend-paying whole life insurance policies to the stock market. Owners of Bank On Yourself-type policies receive a guaranteed pre-set increase every year. No investment – by definition – can even guarantee you won’t lose money, let alone guarantee that your money will grow every year. When the market goes down, it has no effect on your policy, because you’re not invested in the market. In fact, all your gains – every year! – are locked in. They’re yours, and they can’t be taken away from you! How many market advisory newsletters are there? Probably a couple gazillion, because investing in the market takes skill, timing, guts, and guesswork. None of that is required to win with a Bank On Yourself-type policy. With Bank On Yourself-type policies, your money grows more efficiently than with a traditional whole life policy. The growth is exponential. With an investment, as you may know from personal experience, you could have exponential growth for a time, but you could just as easily experience exponential losses. Wait! Doesn’t that same warning apply to Bank On Yourself, too? No, it does not. A life insurance policy is not an investment. It’s a savings vehicle – a savings vehicle with guarantees, unlike an investment. Derek Logan did “all the right things” financially, but he still came up way short in the retirement savings department, thanks to the volatile stock market. Fortunately for the financial well-being of his family, this corporate accountant discovered Bank On Yourself. Now he’s building a comfortable, guaranteed nest egg, and using his policy in ways he hadn’t dreamed possible. For example, just six months after starting his Bank On Yourself-type policy, he was able to use the cash value already built up in the policy to get a new refrigerator/freezer. He borrowed against his policy with no credit application needed. He just contacted the insurance company, told them how much he needed, and where to send the money. Of course, he paid back his loan, but on his terms. A few months later, a dental bill of several thousand dollars sent Derek back to his policy for quick cash. And he was thrilled to be his own source of financing! And later, he was banking on himself again, to pay off his home equity loan. As a corporate accountant, Derek says there are five lies about investing that are destroying our wealth. Find out what the five lies are, and hear Derek tell the story of how he came to trust Bank On Yourself as an investment alternative in his interview with Pamela Yellen. Joni Schultz is a now-retired hospital department supervisor. She and her husband, Dave, began using Bank On Yourself as their investment alternative because they wanted to supplement their retirement income and add predictability to their financial plan. When Joni and her husband decided to convert their home to a solar-powered system to lower their utility bills and help save the planet, they discovered that traditional financing for such a major purchase can be expensive. But Joni had a Bank On Yourself-type life insurance policy. She borrowed against her policy in order to pay for the system – in full. Was borrowing that much money – more than $23,000 – difficult? Not at all! Joni borrowed the money without an application. She didn’t need the approval of a loan committee, and she knew she couldn’t be turned down for a loan! She set her own loan payback schedule, and when she finishes paying it off, she’ll have the solar system and all the money she paid for it will be back in her policy, where it will be available to help fund her retirement. Read more of Joni and Dave Schultz’s review of Bank On Yourself as an alternative investment. Is it easy to get a loan? Will I have to pay income tax on what I borrowed? What’s the going loan interest rate? How long do I have to pay back my loan? What if I find I can’t repay my loan as fast as I’d hoped? What effect will a policy loan have on the growth of my cash value? Those are all excellent questions! If you’re asking any of these questions yourself, it shows you’re responsible with your money, that you don’t borrow recklessly, and that you want to avoid doing something today that you’ll be sorry for tomorrow. Our article on how Bank On Yourself policy loans work should answer all your questions. And you’ll be ready to fire your banker and credit card companies and become your own source of financing! Greg and Christy Gammon didn’t find Bank On Yourself. Bank On Yourself found them. When their dog bit a neighbor, their homeowners insurance company cancelled their policy. Eager to get a replacement policy, they found an agent who got them the policy they needed, and who also wanted to introduce them to one of his partners, someone who had something he thought they might be interested in. Bad timing! Greg and Christy were moving into a new home and had no time to spare for exploring other options. But eventually they came back to find out more. The partner was a Bank On Yourself Authorized Advisor – one of only about 200 in the country – and he told them about Bank On Yourself. Greg’s reaction was typical: “This sounds good, but will it really work?” Greg and Christy decided to give the concept a try. Lo and behold, it did work! Their money grew steadily and predictably, unlike during their previous forays into the stock market. In fact, Bank On Yourself worked so well the Gammons started a second policy. Then they started two more policies, one for each of their children. Sometime later, they encountered a crisis. Greg got a call from his step-brother, asking if there was any way Greg and Christy could adopt the step-brother’s baby girl when she was born – in just four days! Thanks to the cash value in their policies, the Gammons were able to pay all the fees involved in the adoption with no difficulty. Greg reviews the process and shares why he fell in love with his investment alternative – Bank On Yourself – in this short video update. What Do All These Reviews of Bank On Yourself as an Investment Alternative Have in Common? In this article, we’ve shared reviews of Bank On Yourself from an accountant, a respiratory therapist, and a real estate investor. What do these reviewers have in common? Each of these individuals was accustomed to dealing responsibly with money. Each of them had experienced disappointing results in the market. Each was looking for safe, predictable growth for the money they could not afford to lose. Each of them was openminded enough to learn about Bank On Yourself, so they could make informed decisions about trying this admittedly non-traditional investment alternative. And each of them found exactly what they were looking for in the Bank On Yourself strategy. 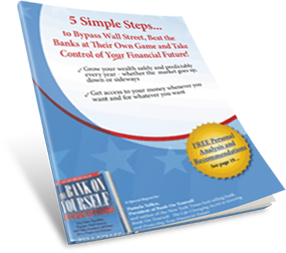 You can get more information about the five-step Bank On Yourself strategy that allows you to bypass Wall Street, fire your banker, and take control of your financial future by grabbing your FREE copy of our Special Report. To learn how a custom-tailored Bank On Yourself plan can help you reach your financial goals (with no obligation), request your free Personalized Analysis. You’ll be referred to a Bank on Yourself Authorized Advisor – a life insurance agent with advanced training in this concept – who can answer all your questions and, when you’re ready, get things moving. We’re looking forward to welcoming you into the Bank On Yourself family!